Dynamic stimulation in unconfined compression can be applied to a specified amount of strain, load, or force in frequencies up to 10 Hz (Fig. 1). Automated analysis of sample properties includes sample thickness, stiffness, and creep. Capture evolution of mechanical properties over time. Eliminate need for specimen transfer to evaluate properties. 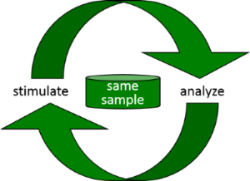 Reduce sample size compared to traditional endpoint studies. Fig 2: Stimulation and analysis of the same sample.